When it comes to buying an engagement ring, there is no shortage of questions to consider. How much should you spend? Where are the best places to shop for a ring? What’s the difference between a cushion cut and princess cut? Engagement rings are often one of the first and biggest investments a young couple makes. As such, this is a purchase that requires some homework before signing for the perfect ring. Before you choose the perfect ring to symbolize your commitment to one another, you’ll want to consider the kind of engagement ring your partner wants, how it fits into your budget, and the various factors that determine a ring’s value in order to make a wise and informed decision. Engagement rings come in every color, style, material and cut imaginable. The sheer number of options can be overwhelming. Your best bet at choosing a ring your partner will love is to find out what they want in a ring and use it to create your shopping criteria. Given that many engagements nowadays aren’t exactly a surprise, you might feel comfortable asking your partner’s preferences directly. Alternatively, you could take a trip to the jeweler together and pay attention to the types of rings your partner admires most. However, if you’d like to maintain at least some element of surprise, you can enlist the help of friends and family. Be sure to ask the people closest to your partner what engagement ring styles, colors, and cuts they prefer. If your partner is an avid Pinterest user, her wedding-related boards could be your best friend. Last but not least, get an idea of your partner’s ring size. If your partner is an avid jewelry person, this should be relatively easy. Grab a ring from their regular rotation and take it to a jeweler to determine the size. In most cases, your perfect ring size will be somewhere around there, maybe a little smaller. But keep in mind — when it comes to buying an engagement ring, slightly bigger is better than too small. According to The Knot’s annual Real Weddings Study, the average cost of an engagement ring hit $6,163 in 2016. That figure is up 21% from an average of $5,095 just five years earlier. However, the average isn’t necessarily what you should spend. Engagement ring budgets vary significantly depending on your financial standing, goals, and preferences. A search online will reveal all kinds of “rules” and calculators telling you how much to spend on an engagement ring. 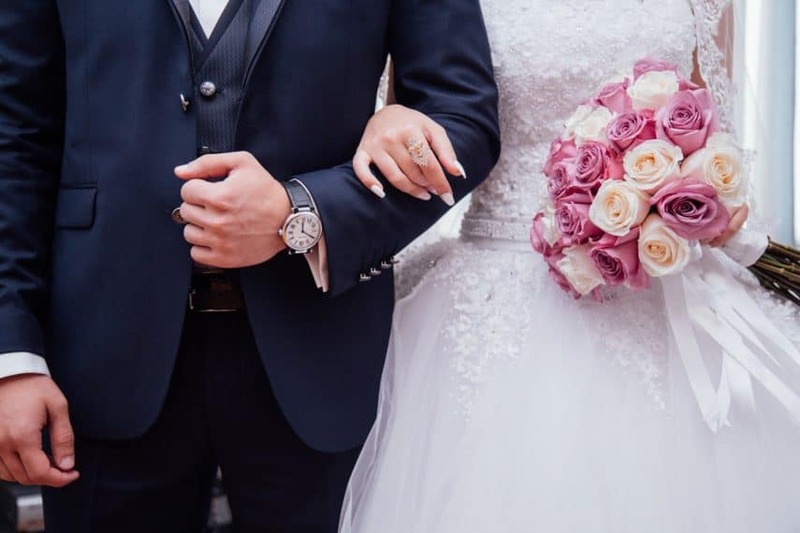 One of the more common rules is the “one/two/three months’ salary rule,” which says you should spend 1-3 months’ worth of your salary on a ring. The idea of spending up to 25% of your annual income on an engagement ring may seem absurd or impractical. This “rule” also doesn’t take into account your debt, savings goals, or any other personal financial information. Option 1: Set a deadline and figure out your savings goal per week, month, or pay period. If your savings goal doesn’t align with your current budget, you may need to look for ways to earn extra money in order to reach your savings deadline. Option 2: Determine how long it will take to reach your goal based on how much you can save each month. With this method, you don’t have to change anything about your current budget or increase your income. Just commit to setting aside a certain amount per month, then calculate how many months it will take to reach your goal. Regardless of which method you choose, it’s wise to save in advance rather than buying an engagement ring on credit and paying additional interest. It’s not worth it to go into debt to have the “perfect” ring — or any ring at all. There are ways to save money on pretty much anything, and engagement rings are no different. Rather than paying full retail price for your ring, consider shopping on the savvy side. Whether you decide to purchase your engagement ring online or in-store, be on the lookout for discounts or cash-back offerings. For example, Ebates currently offers up to $75 cash back when you shop at Blue Nile, 3.5% cash back at Kay Jewelers, and 7% at Jared. These figures change frequently, so be sure to check out Ebates’ jewelry deals for the latest bargains. It’s a polarizing tip since some people believe it’s bad luck to wear a used engagement ring. However, if your partner isn’t superstitious, consider browsing pawn shops, estate sales, or antique stores for a quality ring at a discounted price. When shopping for a secondhand ring, only buy with a written guarantee that you can return the ring for a full refund. That way you aren’t stuck with a dud if an independent appraisal doesn’t match up with what the seller tells you about the ring. Having your own appraisal done will ensure you’re actually getting a good deal. If a secondhand ring doesn’t appeal to your partner, you can still cut costs by looking for something vintage or used. Rather than shopping for a secondhand ring, shop around for a necklace or earrings with a great diamond or two, then head to your jeweler to have the perfect custom ring set. A family heirloom with great stones but a dated setting can also be reset into a beautiful reimagined ring. Christmas and Valentine’s Day are extremely popular times for people to pop the question. If you’re shopping for a ring in the days leading up to those holidays, ring selections may be picked over. That means you’re unlikely to get the best possible deal. 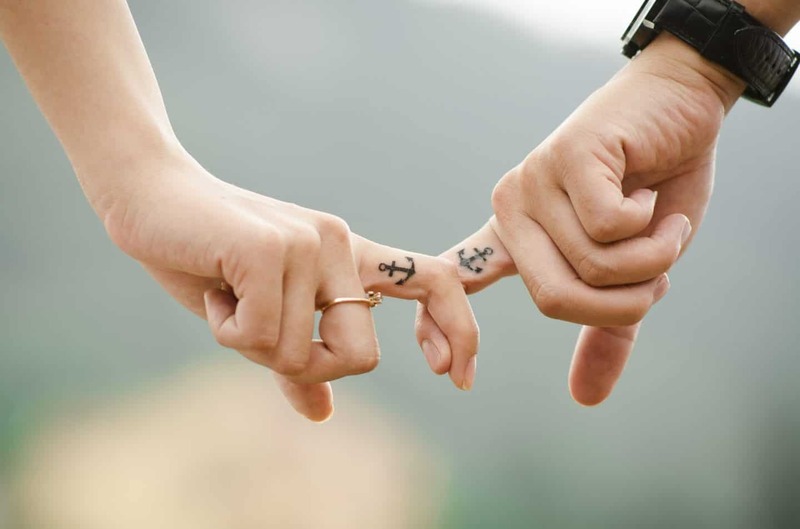 Consider whether you and your partner have a memorable date for your relationship that would make for a romantic proposal during a time of year when rings aren’t in such high demand. Understanding how diamonds are valued allows you to work the system to get the best possible price. If you’ve been shopping for rings, you’ve probably heard of the “four Cs” — cut, color, clarity, and carat weight. These are the factors used to value diamonds. Each of the Cs can affect the price, and there are ways to work each one to get a better deal on a diamond ring. Round diamonds tend to be the most common cut. As such, it’s no surprise that they’re also the most expensive. Less common cuts, like marquise, oval, and pear cut diamonds can save you 25% or more than round diamonds of similar size and quality. Their elongated shapes also make them look larger than round cut diamonds. Many people don’t know that diamonds come in just about every color you can imagine. Traditionally, the most sought-after diamonds have been the ones that range from clear (D) to yellowish (Z). The ones that are perfectly clear tend to be the most expensive. It’s possible to save on diamonds by buying one that isn’t perfectly clear. One trick is setting a yellowish stone into a yellow gold band, causing the diamond itself to look more clear. Yellow diamonds are also on trend right now and can cost less because they aren’t the traditional “perfect” diamonds, despite becoming popular in recent years. As diamonds form, they trap small amounts of non-carbon elements inside, which can affect their clarity. They’re rated on a clarity scale based on how easily diamond graders can see these imperfections, called inclusions. Your best bet as a budget-conscious shopper is to look for a diamond ranging from VVSI to VS2. It’s not perfectly clear, so the price will be lower. But any inclusions are minor and can only be seen by a highly skilled eye. Considering the average person can’t see them, no one will even know they’re there. Typically, bigger diamonds are more expenses. However, that’s not always the case. To save money, look for a diamond in a slightly off weight. For example, a 0.97-carat diamond will look identical to a 1-carat diamond to the naked eye. However, it’s likely to come with a significant price discount because most shoppers look for diamonds in full or half-carat weights. There are also ways to make a smaller carat weight diamond look larger. Consider a diamond with lower depth, which can have less carat weight but look like a much larger diamond on the finger. You could also opt for a halo ring. The “halo effect” makes a smaller center stone look larger by surrounding it with a ring of smaller diamonds. As a bonus, halo rings are very trendy right now. Of course, it’s possible to forego diamonds altogether and save money by choosing a ring with a different kind of stone. There are plenty of alternative gems that, to an untrained eye, are nearly indistinguishable from real diamonds. These can come at a fraction of the price of real diamonds while still giving you the look of a diamond ring. You could also choose a different kind of gem altogether. Diamond engagement rings have only been popular since the mid-1900s. Before then, it was more common to propose with sapphires, emeralds, and rubies. There’s nothing to stop you from choosing a non-diamond ring for a truly unique look — often at a much lower price. 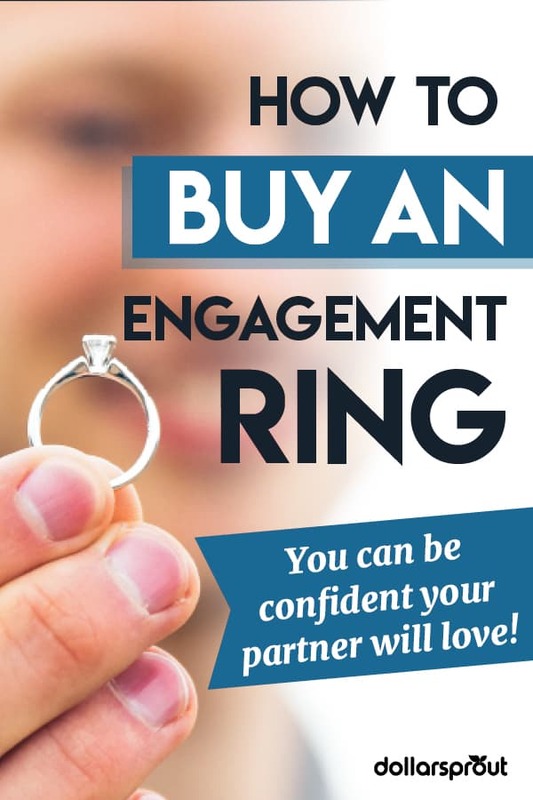 Once you’ve determined your ring criteria, set a savings goal, and figured out how to get the best deal possible, the next step is to decide how to buy your engagement ring. More and more couples are turning to the internet when it comes to searching for the perfect engagement ring. The wide variety of choices online gives couples more opportunity to find exactly what they’re looking for, and price comparison is easy to do across websites. Online retailers, like Blue Nile, have even taken advantage of lower overhead costs compared to brick-and-mortar retailers, and are able to pass on significant savings (sometimes up to 50%) to their customers. If you choose to shop online, be careful to ensure you’re buying from a legitimate seller. Never buy a diamond engagement ring online without getting it certified for authenticity and value through the Gemological Institute of America or a similar organization. Reputable sellers should be happy to provide you with a certificate. Also make sure you fully understand the shop’s warranty, care, and return policies. The one huge advantage to buying a ring in person versus online is the ability to negotiate the price. Just like when buying a car, the sticker price you see on an engagement ring in a jewelry store is rarely the lowest price the store will accept. 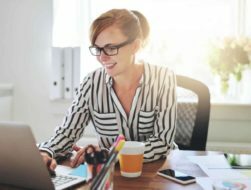 The downside to this is that having a pushy salesperson hovering around can be stressful to a budget-conscious ring shopper. Purchasing an engagement ring may feel like a daunting task. However, all it takes is time and research. Be sure to check in with your partner (or their friends and family) to get the scoop on their ring preferences and size. This will keep you on the right track and help you set your budget so you can start saving. Also consider less traditional options that may save you money, like choosing a non-diamond ring or upcycling jewelry. Finally, make sure you purchase from a reputable source that can back up their claims. Preparing ahead of time will help ensure that special day is a memorable one you both cherish for years to come. This guide walks you through, step by step, how to make a budget that you can actually stick to. Creating a budget doesn’t have to be scary or overly restrictive. In fact, a good budget is flexible!